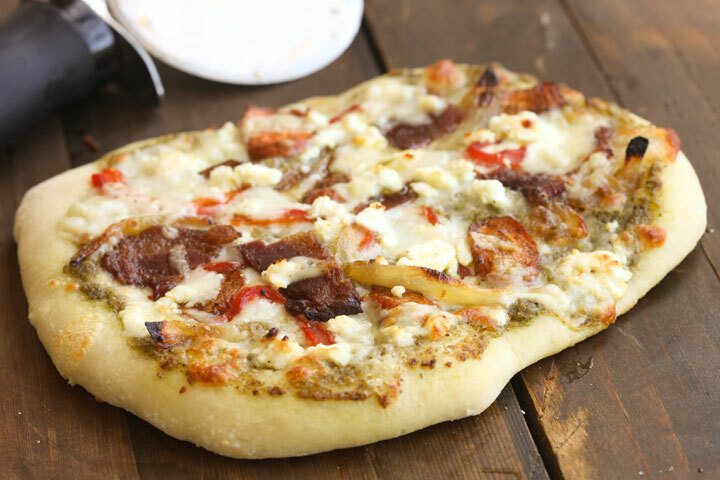 We’re eating thin crust pizza topped with roasted jalapeno, culantro & pecan pesto, bacon, feta, caramelized onions, curry roasted carrots, and roasted red peppers, drizzled with garlic, asiago & parmesan cream sauce. Yesterday I promised you the recipe for the roasted jalapeno, culantro & pecan pesto and lookie! I’m actually fulfilling my promise! 😉 Honestly, this pesto is one of the best things I’ve eaten in a while. I do live in a bit of a good food desert, so maybe my ‘buds are more easily satisfied these days but O.M.G. delicious! This spicy, bright, nutty pesto was so good that when I got to the last few tablespoons I opted to just eat it straight rather than watering down the flavor with whatever incomparable food item I would find to put it on. Don’t get me wrong, it worked fabulously as a pizza topping and I would love to use it as a pasta sauce or spread for a sandwich/wrap or a layer on a bruschetta or any other thousand ways I could dream up to use it, but I didn’t want to dilute it’s awesome flavor. Assuming you like cilantro and jalapenos, I promise you’re gonna love this one! Question: do culantro and cilantro taste the same? They look nothing alike and I’ve always wondered because I’ve never tasted culantro. yep! they look nothing alike but taste virtually the same! totally interchangeable!